With all the topsy-turvy weather and disasters Mother Nature has generously endowed her nations with over the past year, many cities are adapting and, in cases of major flooding, turning their attention to the mostly unseen world of infrastructure. Hurricane Matthew — a Category 3 storm of Oct. 7, 2016 — left St. Augustine, Fla., with tremendous flooding in which water consequently flowed over a seawall and filled the streets. 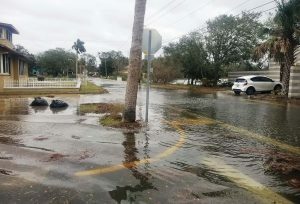 St. Augustine has since put more than a quarter-million dollars forward to kick off a project that focuses on the flooding around Lake Maria Sanchez. It is an endeavor that has also attracted major support from the Federal Emergency Management Agency because of Hurricane Matthew. This pilot study area for the Florida Department of Economic Opportunity was titled the “Community Resiliency: Planning for Sea Rise” project and is actually divided in half, according to Reuben Franklin Jr., professional engineer and mobility manager employed by the city of St. Augustine. Because many Florida communities like St. Augustine have been experiencing the undesirable impacts of elevated sea levels, harsher storms and more intense downpours, the DEO community resiliency initiative aids them in assessing vulnerabilities to projected increases in coastal flooding and in creating strategies to make their areas better able to recover quickly. The objective — and probably the most intensive hazard mitigation project — is to make the area able to defend itself from a Category 1 hurricane, which is something St. Augustine’s seawall is capable of holding back. The city’s share of the total project will be around $2,875,000, including the design phase. Included in the project are the installation of stormwater backflow prevention valves; the creation of a larger stormwater collection system on Cordova, Bridge and Granada streets; excavating the lake; the placement a stormwater pumping station at lake control gates; and the design of a system to protect properties along the marsh south of South Street from flooding. 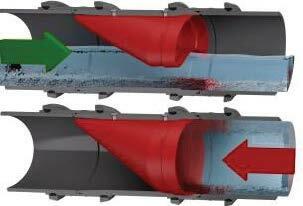 When asked what projects the city was working on to protect historical/cultural resources and low-lying critical infrastructure, Franklin mentioned the installation of tide check valves on stormwater outfalls to prevent tidal waters from backing up through the stormwater system and causing flooding. “The city is also in the beginning stages of designing a pump station and flood protection barrier for the Lake Maria Sanchez Basin,” said Franklin, whose title during the study was stormwater engineer. Jessica Beach, professional engineer, is the city’s new stormwater engineer. While the city is taking proactive measures to address sea level rise, Beach noted that this was not the only project to address the matter. “It’s multiple projects that are in various stages: some are completed; some are nearing completion; some are in the design and permitting stages; and others are future/ planned projects,” said Beach. How many people were involved in the pilot study? The city also plans to secure disaster relief funds from the U.S. Department of Housing and Urban Development, which had been awarded to St. Johns County of which St. Augustine is the county seat. Mean Higher High Water, or MHHW — defined as the highest daily high tide, representing the limit of where land is “wetted” on a daily basis and has very limited use. Nuisance flooding — defined as a minor flood event that occurs monthly, often resulting in the flooding of roads. This type of flooding has the largest potential for increase with SLR. 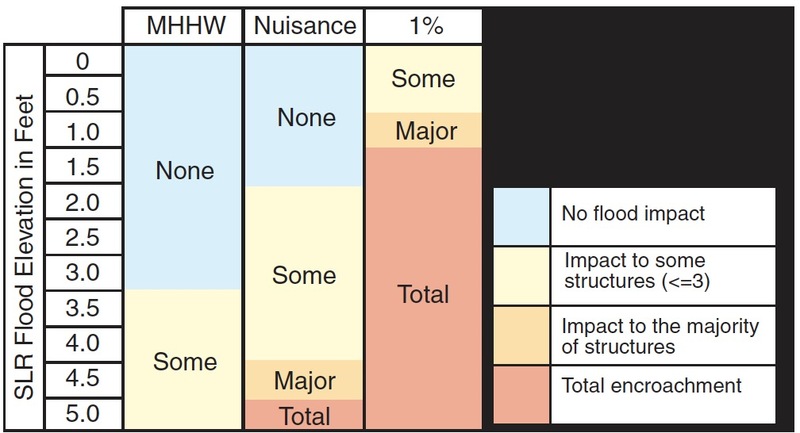 The 1 percent annual chance flood, also known as the 100-year recurrence interval flood — defined as the Special Flood Hazard area depicted on FEMA Flood Insurance Rate Maps. Such an event has a 1 percent chance of occurring in any given year, and a 26 percent chance of occurring over a 30-year timeframe. 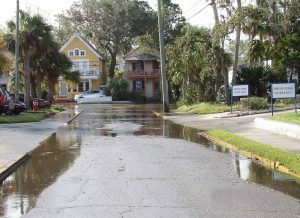 Of the three types evaluated, nuisance flooding has the largest potential to impact St. Augustine in the near term. An additional 500 acres of land are vulnerable to nuisance flooding with 1 foot of sea level rise. Make infrastructure and the built environment robust to expected changes. Make systems — physical or organizational — that are vulnerable to SLR more flexible by altering and/or moving their components. Enhance the ability of natural systems to reduce vulnerabilities. Identify mal-adaptions and begin undoing them. Inform the public about the short- and long-term risks that SLR will create. Various policy tools are available to localities seeking to adapt to SLR. Some of these tools include transferable development rights; incentives; setbacks and buffers; rebuilding restrictions; stormwater utility; special assessments; building codes and design; floodplain regulations; zoning and overlay zones; hard- and soft-armoring permits; conditional development; impact fees; conservation easements; real estate disclosures; coastal land acquisition programs; and land trusts. Two intensive reports that have been made on this project were recently released a few months ago — the “Coastal Vulnerability Assessment” and the “Strategic Adaption Plan.” Both can be viewed at www.citystaug.com/government/public_works/ResiliencySustainability/CoastalVulnerability.php.